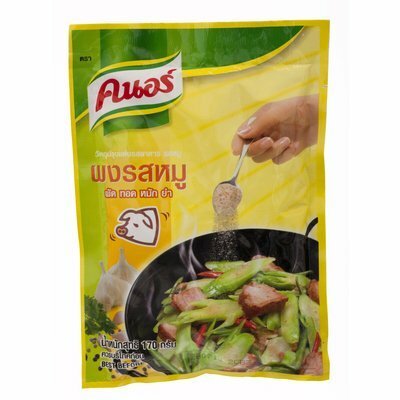 Knorr Seasoning Powder (Pork Flavour) 170g. Light soy(a) sauce: A Chinese all-purpose soy sauce. Light in color, thin in consistency and saltier in flavor. Often use as condiment or in dipping sauces. If a recipe calls for soy sauce without further specification, you are safe to assume light soy sauce. Light soy sauce may also be labeled as thin soy sauce. Dark soy(a): A Chinese darker, thicker, and richer soy sauce. Molasses and corn starch are added and aged for a longer period than light soy sauce. Often use in marinades, sauces and wherever color is needed. Dark soy sauce may also be labeled as thick soy sauce. Shoyu - A Japanese variety of all-purpose soy sauce. Tamari: The gulten-free Japanese variety of soy sauce made with little to no wheat. Oyster sauce is a thick, brown sauce with a earthy, salty, slightly sweet flavor. It is traditionally made by simmering oysters in water until the liquid reduces and caramelizes into a thick brown sauce. Nowadays, for mass production, oyster sauce starts off with a base of sugar, salt, MSG, and soy sauce. Corn starch is used to thicken the sauce and oyster extract is added at the end for the umami flavor. A vegetarian version of oyster sauce uses mushrooms instead of oysters. Oyster sauce is often used to dress vegetables and noodles in many stir-fry dishes. It's also used as marinade bases. My favorite oyster sauce is Lee Kum Kee's Premium Oyster Flavored Sauce. A whiff from this bottle can have you running for the door. Some people will refer Fish Sauce to liquid death. Fish sauce is a staple ingredient in many Southeast Asian cuisine, particularly Vietnamese and Thai cooking. It is made from fermented fish. Fish (usually anchovies), salt and water is left to ferment in the hot sun for a few months up to a year, breaking down into their own juices. That liquid is then strained, filtered and bottled. Fish sauce is a clear reddish brown with a highly pungent aroma and salty taste. When combined with sugar and other spices, the flavor mellows out to provide a more apparent umami and complex flavor. Fish sauce is often used in marinades and dipping sauces. For dipping sauces, lime juice is added to reduce the fishy smell. Before you go knocking on fish sauce, think of it as the Southeast Asian equivalent of Worcestershire sauce, which is also made out of anchovies. I can't go without fish sauce in my pantry. At the same time, I'll die if I ever get fish sauce on my clothes. There are many types of fish sauce. My all-time favorite is Viet Huong's 3 Crabs Fish Sauce. Pork / Chicken / Mushroom Soup Stock Powders are used in a lot of traditional Vietnamese dishes and it's these powders that gives dishes an authentic Vietnamese flavor. Try a recipe without it and it's simply not the same. Vietnamese cookbooks published in America will never list the use of stock powders in their recipes. Maybe because they are hard to find in American supermarkets? Maybe it's taboo to use the stock powder as they do contain MSG (Monosodium Glutamate)? Whatever the reason they are left out in recipes, you are missing out on the many depths of flavor they provide. Please note these stock powders are never meant to be used on their own. They are used in combination of a traditionally made stock (slowly simmering meats/bones/vegetables) or as a seasoning component in a marinade. Out of the three, chicken stock powder is the easiest to find. They are readily available in both Asian and Latino supermarkets. 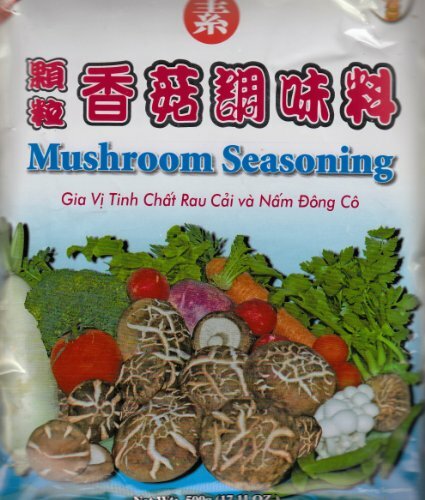 Mushroom stock powder is readily available in only Asian supermarkets. Whereas, pork stock powder, in my experience, can only be found in Vietnam. I use the stock powders interchangeably but will stick to mushroom soup stock powder for vegetarian dishes. When it comes to pricing, the mushroom stock powder is the most expensive, as it uses mushrooms for the umami flavor and not MSG. Do not confuse these stock powders with the bouillon cubes or pastes. Pork/Chicken/Mushroom stock powders are made from stocks that have been turned into small granules. Bouillon cubes...who knows what those are made of, but one thing's for sure, they are awful. 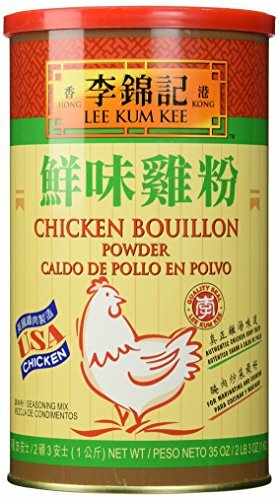 I bought bouillon cubes in place of stock powders once. All ended up in the trash. Vietnamese traditionalists forego stock powders altogether and simply use MSG. Used in small quantity and in the final stage of cooking, MSG is a fantastic flavor enhancer.